At YS Flooring you’ll find a wide variety of commercial wood flooring services. We also will repair, sand and refinish existing floors. And we provide a wide variety of wood for new and replacement installations. 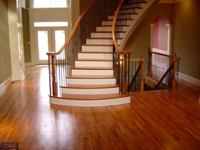 YS Flooring's professionals deliver only high quality workmanship. Every wood floor is installed according to specification. Complete customer satisfaction is always the goal. Wood floors have many advantages over other floor coverings. They are warmer and often less expensive than marble or other stone floors. 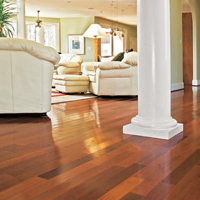 A wood floor is also more elegant and durable than a vinyl or other synthetic floor. Unlike its laminate look-alike, a genuine solid hardwood floor not only looks like wood, but it feels like the real thing as well. Laminate floors are made from photographs of wood that are laminated or coated in a thick synthetic material. The appearance is of genuine wood grain but whereas wood strips are nailed in place to create a genuine solid hardwood floor, a laminate wood floor is put on in sheets. Older laminate floors tend to pull up when walked on and make a noise that is not like a genuine wood floor. While laminate floors are cheaper, they aren't considered to add as much value to a home as genuine wood floors. The only advantage laminates have over genuine wood is that they tend to stand up better to pets' nails, as laminate doesn't scratch as easily as real wood. Wood floors can be sealed to help them become less resistant to scratching. Wood floors can also be sanded and refinished by a flooring company and this is a strong advantage over other floors because it gives a solid hardwood floor the ability to last for many decades. A wood floor is also a natural product that is environmentally friendly. Wood grown in sustainable forests as well as recycled or reclaimed wood can be used to create hardwood floors. Indoor air quality is greatly improved by wood floor covering as opposed to synthetic wall-to-wall carpeting. Carpeting is not only made with chemicals, but it tends to trap dust and dirt in its fibers. No washing is a big advantage of having genuine wood flooring. Dry mopping and regular vacuuming work best to maintain a wood floor. Another advantage of wood floors is that there is a large selection of different types and colors to choose from that will suit each particular room and decor. Cherry is an elegant looking wood for floors and it can be the ideal choice for kitchens with cabinets in the same wood. Maple is strong and has a consistent texture that many people find appealing in wood floors. An oak wood floor is a popular choice when light colored flooring is wanted.